Red Bud Industries, Red Bud, IL, has sold coil-processing systems to Holvoet NV (plants in Kortrijk and Gent, Belgium) and to Mid Metals, Yatala, Queensland, Australia. Holvoet purchased its third Red Bud line, this one a multiblanking line for coils to 0.138 by 72 in. The line combines the slit-to-width and cut-to-length processes into one operation to produce custom blanks directly from a master coil. For Mid Metals, Red Bud installed a precision blanking line for material to 0.393 in. thick, with stretcher-leveling to allow the Greenfield site to serve the laser-cutting and fabrication markets. It can process stainless-steel coils to 79 in. wide, 53,000 lb. with part length to 355 in. and length tolerances of ±0.005 in. Red Bud also has published a new brochure introducing the Eco Picked Surface (EPS) process as an environmentally friendly direct replacement for acid pickling. Comparatively, EPS lines consume less floor space and are less expensive to operate. The process uses a slurry mixture of water and steel grit propelled onto the strip in a uniform stream to remove surface scale. 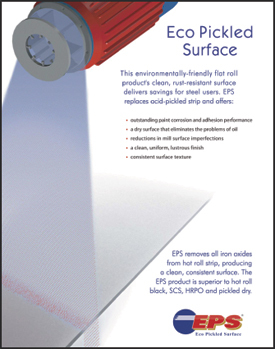 The EPS process can reduce common mill imperfections such as roll marks, pitting and silicon streaks. And, according to Red Bud, EPS-processed steel resists rusting longer than does pickled steel, and it can be shipped dry to customers, eliminating the need to oil the material. The brochure goes on to explain the benefits of the EPS process when welding, stamping and rollforming.